After 14 months in power, Emmanuel Macron's poll ratings have been falling steadily, down to barely 40 percent. Emmanuel Macron can expect the euphoria to unleash a wave of renewed self-confidence and national pride. France's thrilling 4-2 triumph over Croatia in the World Cup final on Sunday, their second World Cup after home success in 1998 that ushered in a wave of national optimism, is the sort of good-news fillip most presidents can only dream of. 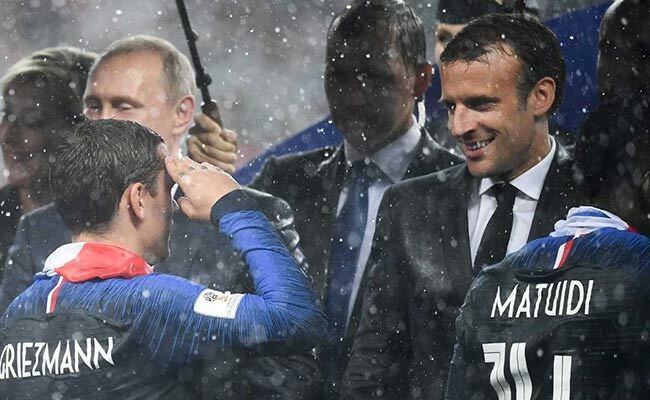 In Moscow to watch the final with his wife Brigitte, Macron was overcome by the victory, standing on the field in the pouring rain to hug each of the players in turn at length and then kissing the World Cup trophy in delight. Macron's lieutenants have sought to play down any suggestion that politics and soccer are linked. They don't want the president to be accused of leveraging the World Cup, even if Macron and his wife were in Moscow to watch the final. After years of high unemployment, economic stagnation and a string of deadly Islamist attacks since 2015, the World Cup win may help the nation feel the worst is behind it. That may also help sweeten the pill that the government is shortly to unveil, with unpopular spending cuts due after the summer. According to Subran's research, the World Cup will boost French consumption by 0.2 percentage points this year, which in turn will give wider economic growth a 0.1 point lift.